Global Premier Soccer and the Portland Housing Authority team up to offer a daily afternoon soccer program for youth of all ages. The practices are held at Fox Street field and Sagamore Village from June 29th 2015 through August 20th 2015. Study Center coordinators have been hard at work this autumn setting up centers, knocking on doors, and practicing their Algebra. It has all paid off and the centers are thriving! Our AmeriCorps members have been rolling out the new Check & Connect Mentoring Program which will hopefully help a ton of students engage and invest in their futures. Implementing new programs can be tricky and it has not gone without a few bumps in the road but we are optimistic that it will only get better as relationships grow. I was thrilled to hear in October about student's ideas for an MLK project which is now underway and I am SO excited! I dare say this could be even cooler than the quilt we made last year. We have a really strong team on board doing great things in the communities. As always, if you are interested in joining our team, we are always looking for volunteers to help with homework, support adult learners, and bring a creative flair to our fun Fridays. 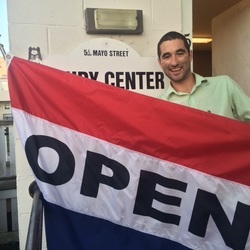 Alex is in his first year working at the Kennedy Park study center. He moved up to Portland this year after living and teaching marine science aboard the tall ship The American Pride. He also has experience working with preschoolers in the area at The Children's House daycare as a primary teacher. In school, at the University of Maine at Orono, he majored in English with a creative focus in poetry as well as a minor in Earth Sciences. Alex knows this year is going to be full of enriching experience as he becomes more involved in the community. Megan is serving her first year as the Check & Connect Mentoring Coordinator for the Kennedy Park study center. She recently moved from North Carolina where she has taught in both preschool and elementary schools. 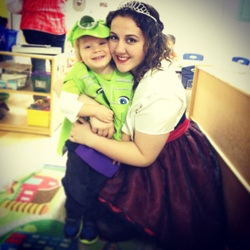 She received her Bachelors degree from the University of North Carolina at Wilmington in History and Classical Studies but quickly realized that her heart was working with children and is extremely excited to continue this with the Kennedy Park Community. Megan is more than excited to explore not only Maine but to become a part of the Kennedy Park community and looks forward to the year to come! Solomon is serving his first season as a part time Portland Housing Authority Youth Programming staff in the Riverton Park Study Center. He is a graduate of the University of Southern Maine from where he obtained a Masters in Public policy and management in addition to a Graduate Certificate in Applied Research and Evaluation Methods. 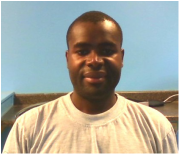 Solomon also holds a Bachelor's degree in Economics and an Associate's of Business Administration and Management from University of Maine and Southern Maine Community College respectively. Throughout his college studies Solomon worked as a Statistics, Algebra, and computer tutor. He is committed to community service; he has volunteered as a 4-H camp counselor, big brother big sister mentor, and tutor. Back in his native country of Malawi, he is a coordinator for the charity organization, School of HOPE that provides 200 elementary school children with school supplies and mentoring service. Additionally, he volunteers with Go! Malawi and Samba International organizations that work on educational programs in rural Malawi. Solomon's commitment to service led to his recognition as the recipient of the Dean's award for the Muskie School of Public Service's class of 2015. During his spare time, he likes reading, poetry, biking, playing soccer and running. Solomon is very excited to work with youth and adult residents of Riverton Park and surrounding areas. Mr. Sharif-Isaack is serving his first term as the AmeriCorps Academic Engagement Specialist in the Riverton Park Study Center. Before his current service, he served a 300 hour AmeriCorps term in Riverton coordinating summer programming. He grew up in the community and is well known. 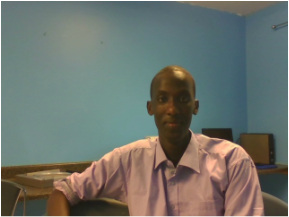 As a young man, Mr. Sharif-Isaack was an active member of the Study Center program. He is a founding member of the CHEETA project. He volunteered in several of Portland Housing Authority programs like the Summer Soccer and lunch programs. He currently studies Computer Technology at Southern Maine Community College. Community Financial Literacy (CFL) strives to enhance the lives of refugee and immigrant communities in Maine by teaching them financial literacy skills for a better future. They are a resource to community members seeking financial guidance and services. The CFL office is located at 102-104 Riverton Drive. Contact Claude Rwaganje or call 797-7890 for more information. Sil grew up in the Sagamore neighborhood and has a serious passion for community engagement and support. As a social work student, Sil gained valuable knowledge and resources that he has brought back to the neighborhood he loves. His caring for the neighborhood and it's residents is palpable. Sil is returning for a second AmeriCorps term with the Goodwill Multilingual Leadership Corps to continue his work in the Sagamore Community. In order to encourage academic excellence and community responsibility among high school students, PHADA has implemented a scholarship program for graduating seniors who are preparing to enter college. PHADA will award three (3) scholarships to deserving youth currently residing in a PHADA member agency. 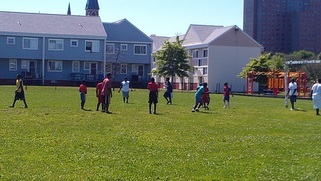 Soccer Maine and the Portland Housing Authority team up to offer a daily morning soccer program for youth of all ages. The practices are held at Fox Street field from the end of school until mid August. Sewing classes are resuming at 102/104 Riverton Drive on Mondays and Wednesdays from 1-3pm. Back by popular demand, professional sewing classes will be offered to help residents develop marketable skills. The City of Portland Public Health Minority Health Program, Healthy Portland, Maine Medical Center, Mercy Hospital, Cultivating Community, and individual collaborators work together to offer Zumba classes every Saturday, physical activity video instruction viewing and follow-up on Tuesdays and Thursdays, cooking demos, social networking and sharing, and fresh fruits and produce delivery on Saturdays. Contact Asha Suldan at 344-5056 for details. Living with Peace is a non-profit 501c3 organization that offers cultural enrichment programs to immigrant youth. 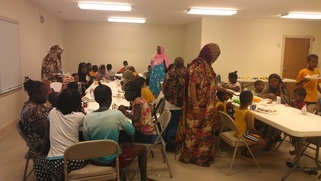 Living With Peace is providing Naath language instruction for children of the Nuer (African) tribe who live in the Greater Portland area and especially in Riverton Park. Programming is offered Saturdays between the hours of 12:00pm and 2:00pm in Riverton Park. Contact Christina Feller cfeller@maine.rr.com for more information.